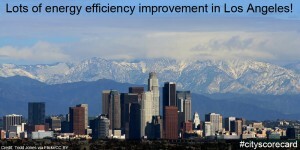 Energy Efficiency Grades Are In – How did Los Angeles Do? School’s out for summer! It’s time to check those report cards and figure out if we made the energy efficiency grade or if we’re stuck trying to catch up. 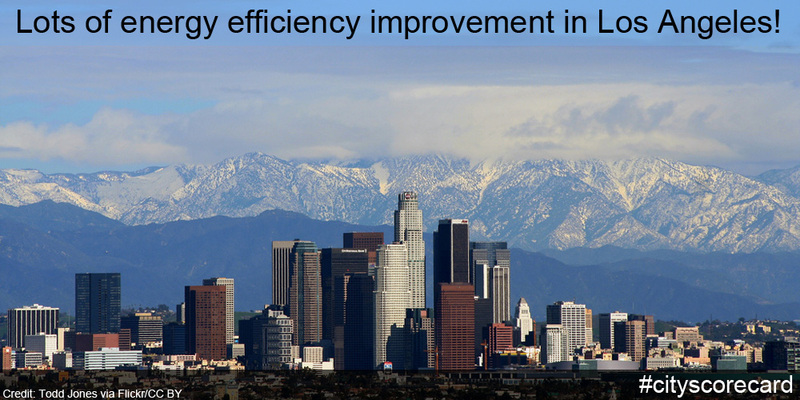 According to the American Council for an Energy Efficiency Economy (ACEEE), who just released their 2015 City Energy Efficiency Score Card, Los Angeles is the most improved city in the country – rising the fastest of all cities and finally breaking the top 15 rankings (up to #12 from #28 last year). ACEEE cites “a strong new suite of climate goals and high marks in energy and water utilities” as key factors in the city’s improved score. For a city the size and scale of Los Angeles (second largest U.S. city in total population, a regional economy larger than most countries, and the largest manufacturing sectors and ports in the U.S.) these are impressive accolades. 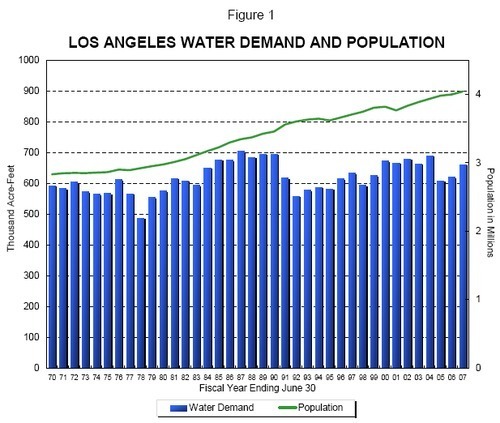 The city has consistently kept water demand relatively flat despite a booming population and desert-like climate. L.A. also has a gold star from the Environmental Protection Agency (EPA) for being ranked second on a list of the top 25 U.S. cities with the most energy efficient buildings in the nation. But L.A. can’t party too hard because the once carefree days of summer are now likely going to be its hardest. Record-breaking heat and worsened drought due to climate change are projected to be the new normal for Los Angeles and many cities like it; the population is expected to grow by 10 percent to nearly 20 million people by 2030 and resources will continue to be stretched even thinner. In fact, several studies have cited Los Angeles as one of the cities most in danger of running out of water in the near- to medium-term. Further, buildings are the second largest source of climate-pollution in the city and the largest users of energy and water. The city needs to prepare now. Taking bold steps to increase energy and water efficiency is more important than ever. We’re pleased to see the mayor is responding with an ambitious plan to boost energy efficiency, calling for the city to shave 15 percent of its total energy demand by 2020 and reduce energy use in all buildings by 30 percent per square foot by 2035. The Los Angeles Department of Water and Power (LADWP), the city’s municipal utility, is already leading one of the most forward-thinking energy efficiency programs in the country. These programs are good for the environment and also boosted the local economy to the tune of $260 million in 2014 alone. 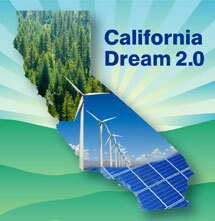 And, the city’s energy efficiency programs are expected to create over 17,000 jobs by 2020. Because buildings are responsible for about 40 percent of energy use nationwide, we’ve got to continue to squeeze as much energy out of buildings as possible. Doing so will reduce greenhouse gas emissions and water use. The continuing California drought is putting pressure on every resident and industry in the state, but it may not be obvious to many that these energy goals are also water-saving strategies. And it even works in reverse: water goals are energy-saving strategies. Energy and water are inextricably linked. Energy is used to secure, deliver, treat, and distribute water, while water is used to develop, process, and deliver energy. This is a particularly tough problem in Southern California. Water that is moved to Southern California is nearly three times as energy-intensive as water moved in Northern California. All those Los Angeles hills mean water moved to hilltop homes is using more energy than those in the valleys. The mayor also has a water plan: reduce imported water by 50 percent by 2025, and source 50 percent of its water locally by 2035. Significant untapped potential for energy savings exists in programs focused on water use efficiency — the California Energy Commission estimates that, statewide, water efficiency programs could achieve nearly all of the energy savings of utility energy efficiency programs at half the cost. Los Angeles has made great strides in recent years by coming to terms with its air quality problems. Now its leadership is tackling energy and water use. We’re looking forward to the day when L.A. moves from “most improved” to “best in class,” when it comes to creating a sustainable, resilient city. This entry was posted in Clean Energy, Energy, Energy Efficiency, General. Bookmark the permalink. Both comments and trackbacks are currently closed.